To improve the productive system, modernize it to make it more efficient so it can face new challenges with success: variety of production, customization of client requests, limited volumes. This is the goal of the National Plan Industry 4.0 based on the development of some enabling technologies, and Lasertube systems have all the necessary characteristics to play an active role in this renewal process. Levico Terme October 23, 2017. The BLM GROUP offers the broadest range of systems for laser tube cutting in the market. Diversified in terms of performance, outlet sectors, dimensions and the weight of tubes and profiles that can be processed, all systems have in common the deep experience in laser cutting which is a company heritage for nearly three decades. There are systems dedicated only to straight cut, in direct competition with blade cutting, characterized by extremely high speeds and low price. The more traditional Lasertube systems are characterized by extreme flexibility, speed and precise execution of the most imaginative laser cutting machining on tubes and profiles of various dimensions. At least seven different system families, with various degrees of flexibility and automation, completely cover a dimensional tube range from 10 mm to 604 mm (0.4” to 23.78”) in diameter. The combined system families are capable of cutting with fully automatic process, both sheet metal or tube, and they constitute an absolutely unique example in the laser systems panorama. 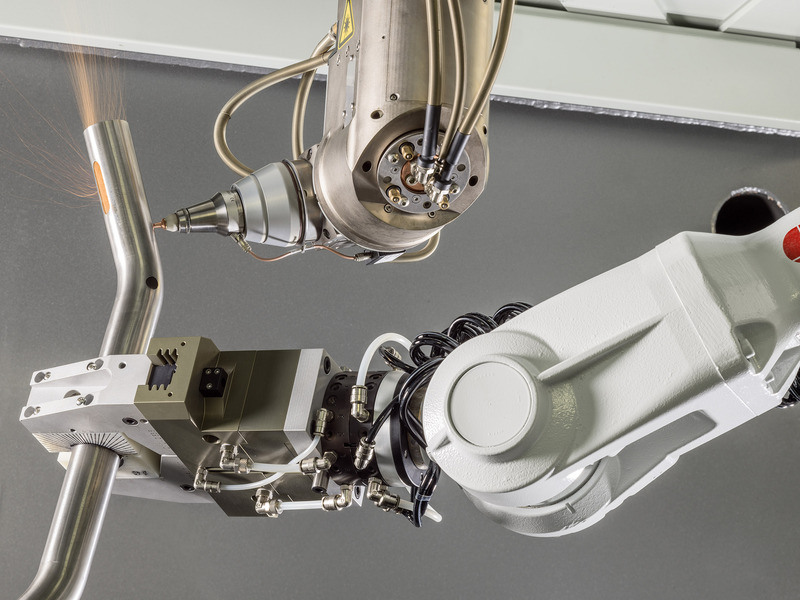 Finally, there are 5-axis cutting cells such as LT-FREE capable of cutting complex geometries on previously bent tubes as well as on sheet metal parts or hydroformed components. All these systems have functionalities and characteristics that allow for inclusion among the enabling technologies for the industry of the future. Very significant in this sense are some of the functions within Active Tools and BLMelements software suite applications. Active Scan is a vision system that measures the section of the tube, compares it with the theoretical in real time and corrects the position according to the error detected. The maximum precision in the least possible time is obtained, eliminating the errors caused by tube deformation. The precision of the cut piece remains within expected tolerances, with minimum impact on productivity and zero waste. With Active Speed the cutting parameters self-regulate instantaneously according to the speed. When the real working conditions change, the system automatically modulates the cutting parameters in order to obtain the best possible quality, right from the first piece. Active Piercing is the function that controls the drilling stage optimizing it in real time according to the parameters detected during the process. The result is a faster and more reliable drilling even in the presence of inconstant quality or thickness of the material. Active Marking is a laser marking function with preselected and calculated data in real time (e.g. date, time, progressive piece number, order). Each piece is uniquely identified and the entire production will be fully traceable. A very important concept for industry 4.0. Protube, is a management application for connection between the design CAD/CAM, the BLM machine and the client’s own production management structure. Protube processes the information received from the CAD/CAM system, automatically creates production orders, sends programs to the machines (even from different technologies) and returns information regarding the production progress to the control management system. Plant interconnection is assured. Artube is the CAD/CAM system specific for tubes designed and produced by the BLM GROUP. It can manage single pieces and multi-technology frames (e.g. parts cut by laser and bent) in a simple and intuitive fashion. Thanks to its context based graphical interface, it only shows the relevant features for each stage, considerably simplifying and speeding up programming. VGP3D is the CAD/CAM system for designing and simulating curved pieces. It is capable of exchanging information with both Artube 3, as well as Protube to speed up production management and keep the progress status monitored. Partviewer A sophisticated instrument that allows not only visualizing the machine programs and simulate their execution but also makes a precise estimation of the cost and time of a piece. It is directly connected to the system via the network and allows simulating the modification of machine options to assess the productivity results that can be obtained prior to cutting a single piece. Composer is utilized to produce families of pieces that are all similar but have different relative quotas and positions. Work groups can be saved and reused later, even with different parameters. This feature can take place automatically via an external ERP system with which Composer can be quickly interfaced. Syncro performs remote monitoring of the machines. It uses production data made available by the machines in the network and Protube data which allows monitoring of BLM GROUP machine operation status, the degree of progress of production batches and any other relevant information for diagnosis and preventive intervention – all from a mobile device.